A traffic stop conducted Wednesday afternoon in Oceano netted 9 grams of methamphetamine and approximately 6.5 grams of heroin, as well as a loaded handgun, each of which were found inside the vehicle of a felon from Arroyo Grande, according to the San Luis Obispo County Sheriff’s Office. At about 3 p.m., Sheriff’s Gang Task Force members made a traffic stop on an SUV for a vehicle code violation near the Pike and 23rd Street, according to the sheriff’s office. Task force members identified the driver as Jesse Richard Wallace, 32. A check of Wallace’s driver’s license revealed that it was suspended. Authorities called a state parks K-9 out to the traffic stop. The K-9 alerted officers that there were narcotics in the vehicle. Investigators searched the vehicle and found a loaded 9 mm handgun with a high capacity pistol magazine. They also found a crystal-like substance that later tested positive for methamphetamine; a dark brown substance that tested positive for heroin; and drug paraphernalia related to the sales of narcotics. 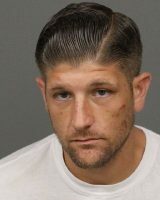 Deputies arrested Wallace and booked him into the San Luis Obispo County Jail on charges of possession of a controlled substance for sale, being a felon in possession of a firearm, possession of ammunition by a prohibited person and possession of a controlled substance while armed with a loaded firearm. The sheriff’s office website does not list Wallace as being in custody, as of Friday morning. It is Clearly in the first paragraph, read it again ” inside the vehicle of a Felon from AG according to the Sheriffs report. Where in the reporting does it state that this man is from AG?